"Shell fish(Oysters) are also called as shell fish which is a good treat for sea food lovers. It is rich in calcium and fatty acid. The only thing you need to be noticed is to clean it well in running water after it is shucked.Cooking gets easier and simple only through experience." Firstly wash and drain the shucked oysters/shell fish. Now in a pan dry roast garlic,ginger,cumin seeds and allow it to cool and grind it. Now mix turmeric powder, redchilli powder, black pepper powder,salt along with the grinded powder and mix well by adding lemon juice to make it a paste. Now apply the paste on oysters and marinate for 5 minutes. In a pan deep fry the oysters/shell fish and serve hot. 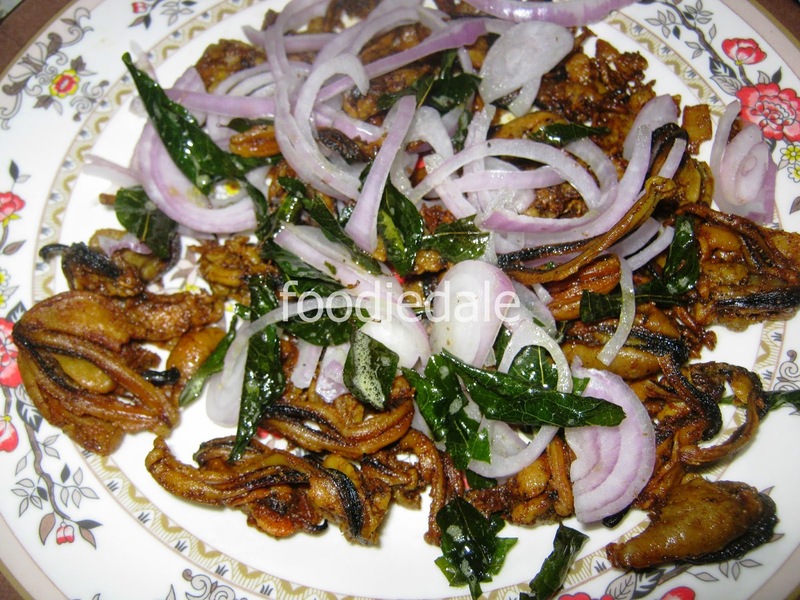 Garnish it with sliced onions and fried curry leaves.